Anyone with little kids knows that adult height closet rods are not a good thing. And when I say little, I mean a nearly 10 year old girl who looks like she is still in first grade. She is old enough to choose her own clothes and dress herself, but simply can't keep her closet straight because it was just not useful. Luckily, I finally found a solution. With all of the new custom built-ins that DH is constructing, we have a few free standing shelves that really don't have a home right now. They will eventually make their way to my mom's basement (which is where all family surplus furniture ends up), but I had one that was still sitting in the dining room and, quite frankly, was just in the way. After freaking out one too many times over the mess in the floor of her closet, it finally dawned on me to get her things on her level. A $29 bookshelf from Target (which earned all that money back over the 7 years we have already owned it) with a couple of holes drilled in each side to hold a stray wooden rod (no idea where it even came from), and voila, an organized closet. Well, it is never that easy as DH had some struggles getting it into the closet as well as some irritation getting the old shelf out, but less than an hour later it worked perfectly. It was basically a free closet redo. And you know "whatever's free works best for me!" Go see what other fine frugalites have come up with. 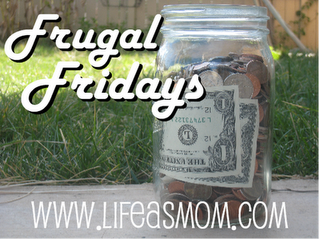 Go on -- scoot over to Life as Mom for Frugal Friday. We had the same problem with my 7 year old's closet! I had an extra tension rod that didn't work for our shower, so I used it to make a lower rod in her closet where she can easily reach all of her clothes. And the best part is now I just rotate the out of season clothes to the top rod! Brilliant! When we built our house we put low rods in every upstairs closet--and we installed an adjustable shower head, too. Great idea. I bet a used bookshelf would be relatively inexpensive at a garage sale too! What a good idea. I think I would add another rod to hang out of season things. (just me) I am going to look into this idea for a 9 year old grandson. I think it would be a big help to him. Two rods are a great idea, but this closet was simply not big enough and we needed all the shelf space we could get for her HUGE collection of shoes......like mother like daughter!